If you’ve not tried a savoury muffin before then you are missing out! I’ve made Cheese & Red Pepper Muffins before that are absolutely yummy and these Veggie Sausage, Cheese & Onion Muffins are an adaptation of that recipe. 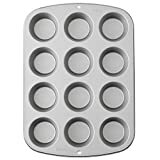 These muffins would be great for breakfast, for a picnic, in lunch boxes or eaten warm on Bonfire Night. They are filling and delicious, and a great savoury snack anytime of year! 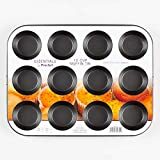 I think sausages particularly lend themselves to Autumn time as they are so associated with cosy meals, and this is a great way to get that feeling but in a portable muffin! 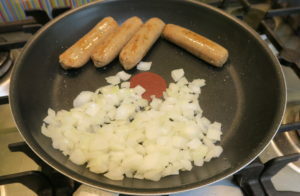 I started by frying the onion and sausages until the onion was soft and the sausages had browned. 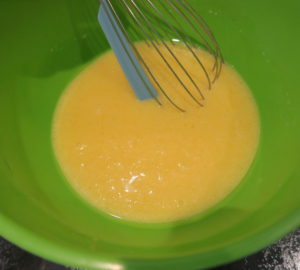 In a bowl I whisked together the eggs, milk and vegetable oil. 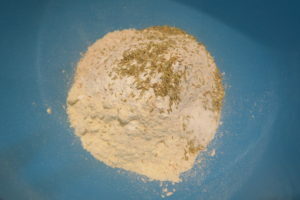 In another bowl I stirred both flours, the herbs, salt and raising agents together. 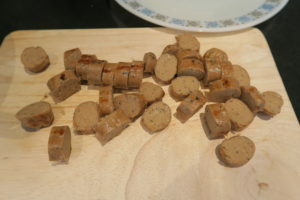 I chopped up the cooled sausages into slices. 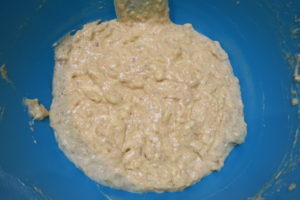 I mixed the dry and wet ingredients together, then added the onion and cheese. 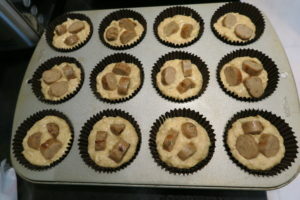 Then I divided the mixture between paper cases, and pushed in slices of sausage. The muffins baked for around 25 minutes until they were risen and golden. The best way to serve the Veggie Sausage, Cheese & Onion Muffins is definitely dipped in tomato ketchup! 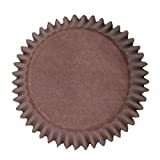 Of course you can dip them in your favourite dip, maybe it’s BBQ sauce or brown sauce, either way it’s a yummy way to eat them! 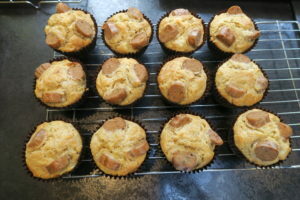 These Veggie Sausage, Cheese & Onion Muffins are such a moreish snack especially on a cold evening! I’m linking this recipe up with Cook Blog Share hosted by Easy Peasy Foodie, Cook Once Eat Twice hosted by Searching For Spice, and Fiesta Fridays hosted by Cooking With Aunt Juju and Turks Who Eat. It is such a long time since I’ve made savoury muffins but these do sound delicious. My little boy loves sauces and if I made them I think he’d be dipping them in ketchup, barbecue and brown sauce! 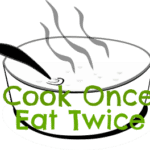 Thanks for sharing with #CookOnceEatTwice! Thanks Corina! Sounds like he’d be in dipping heaven! Thanks Jo! I’m glad I could tempt you! Thanks Eb! I do hope you try savoury muffins – they’re so moreish!